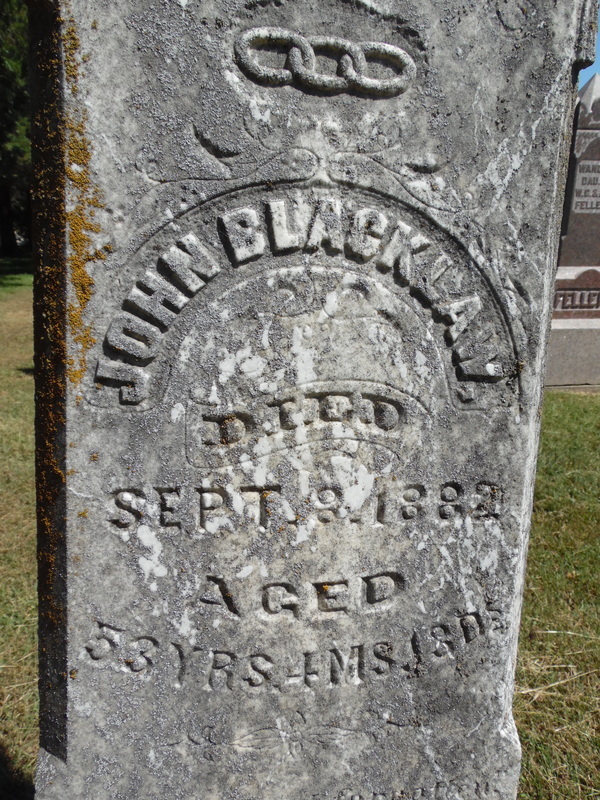 John Blacklaw and his little daughter Lillian, who died in 1876, are buried in the Table Rock Cemetery. Blacklaw, born in England, was an influential public figure in his time, and was killed by a friend under unusual circumstances. Reportedly almost 2,000 people attended his funeral. He had married Margaret Quinlan, born in Nova Scotia, in Richardson County in 1863 according to the blacklawc Ancestry tree. She died in Oregon at the age of 86, in 1924, and is buried there. Her death certificate gave their son Jim as the person supplying background information. 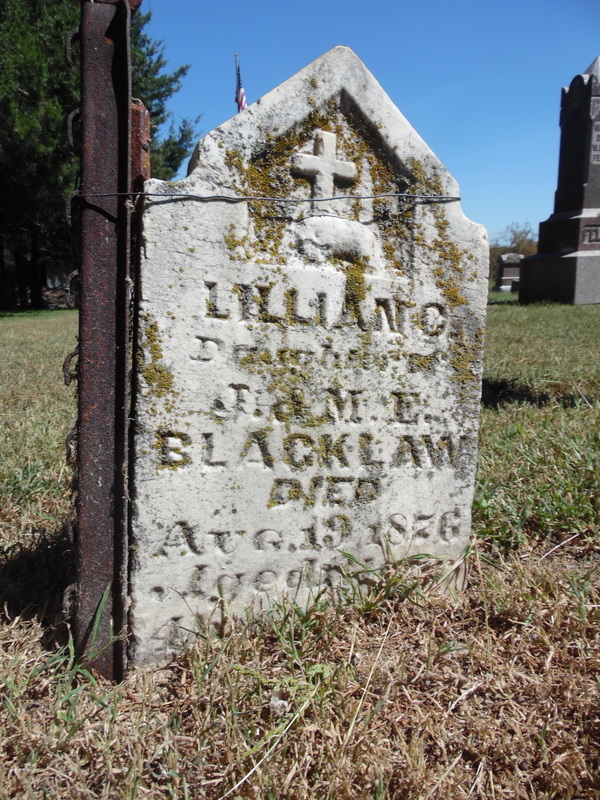 Little Lillian was not the Blacklaw's only child. The 1880 census shows he and Margaret, then 42, with five children at home: Mary, age 16; Anna, age 12; James, age 9; John B., age 7; and Thomas William (Will), age 2. Lillian, who died in 1876, would have been four had she lived, so fell between John and Thomas. There was an older daughter, Josie, who would have been just a year older than Mary. At the time Blacklaw died, if all of his children were still alive, his wife Margaret would have been left a widow with an 18-year-old daughter and four children between the ages of 4 and 14. The last of the Blacklaw children, Annie, died in 1952 and was buried with her sister Josie, who had died in 1946; neither apparently had married. By the time Annie died, the events of her father's death were 70 years in the past. At the time of this writing in 2018, those events happened 136 years ago. "John Blacklaw operated a water-power girst-mill, which has three run of buhrs." Photo 88. To see a scan of the actual picture, follow the Mills link to the right. 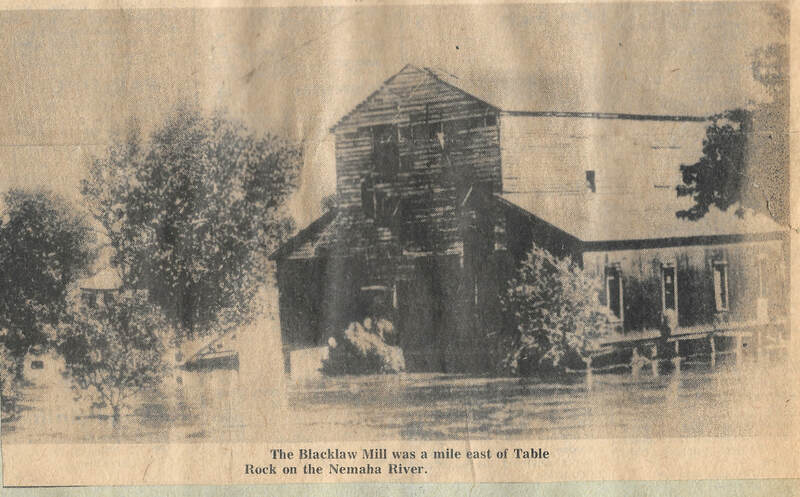 This picture was taken after the mill had been abandoned and was surrounded by flood waters. The country school in country school District 34 was known as the Blacklaw school. It was situated east of town across the highway from where Larry & Karen Gilbert now live. 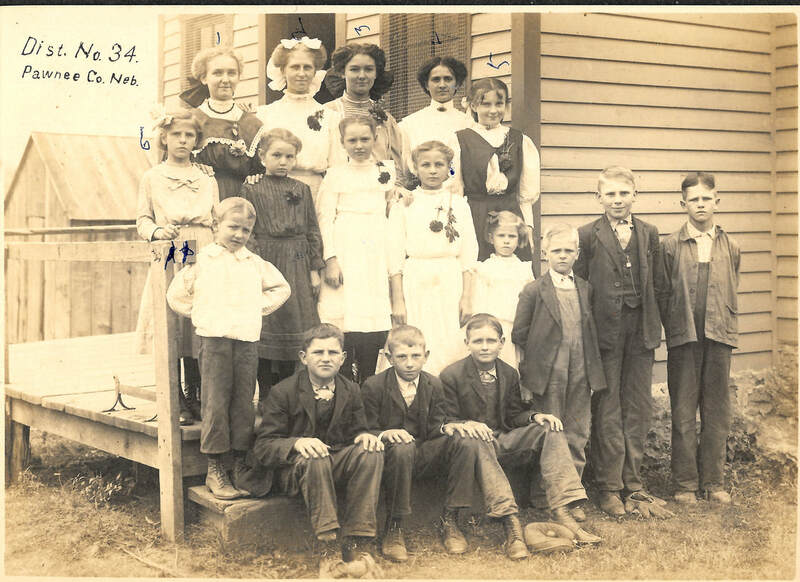 Country schools were usually given an alternate name based on either the owner of the land on which the school sat (and who may have donated the land) or on the more numerous family names in the earliest days of the school, so it is likely that the Blacklaw children attended in their youth. The school existed into the 1940s and possibly 1950s. Below is a picture of a teacher -- Lillian Giles -- and her students at the Blacklaw school during the school year 1944-45. Lillian was a newly-wed whose husband had just gone overseas during World War II, and he was killed in a bombing raid during the school term when this picture was taken. Photo 1756, Lillian Giles with her students Richard Dobrovolny, and Ardyce Fritch Cumro, with brothers Gary, Robert, and Donald Bedea in front. 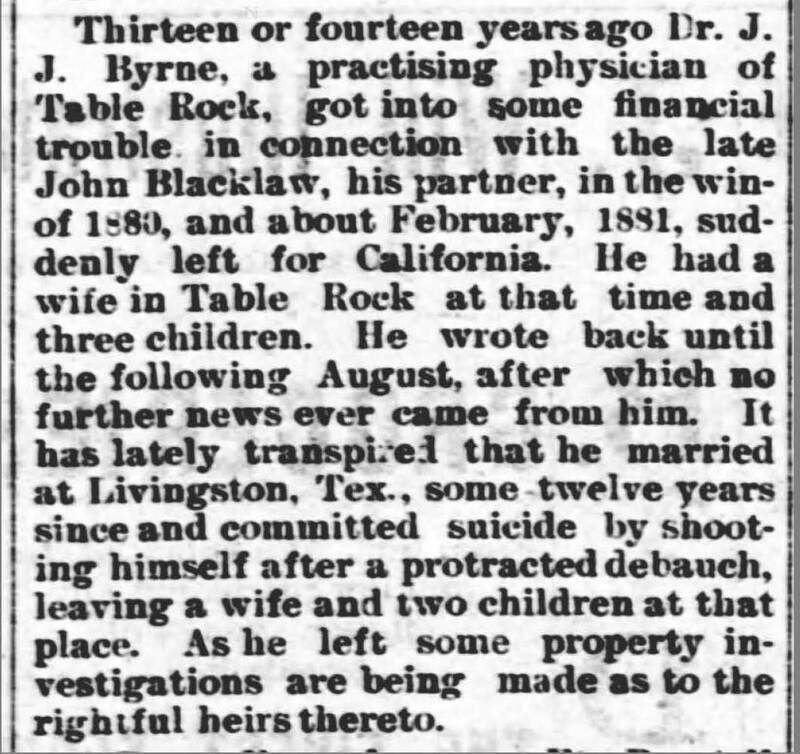 The November 1, 1893 Columbus (NE) Journal carried an interesting report about a Dr. J. J. Byrne's partnership with Blacklaw. The unexplained "financial trouble in connection with the late John Blacklaw, his partner" is not explained. There may have been no wrongdoing by Blacklaw at all but rather Byrne did bad deeds while in the partnership. Whatever happened, it reportedly happened in the winter of 1880, and Dr. Byrne left town in February 1881. 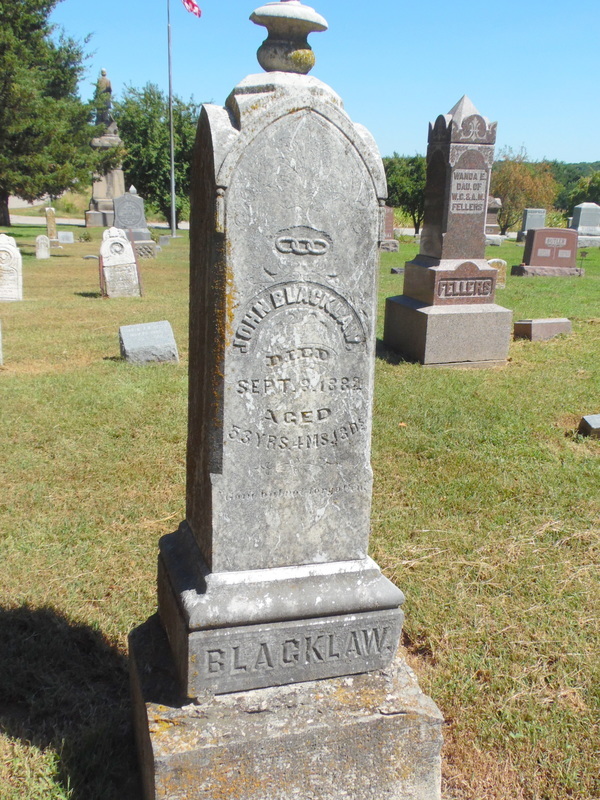 Blacklaw was killed in September 1882 in an unrelated event. 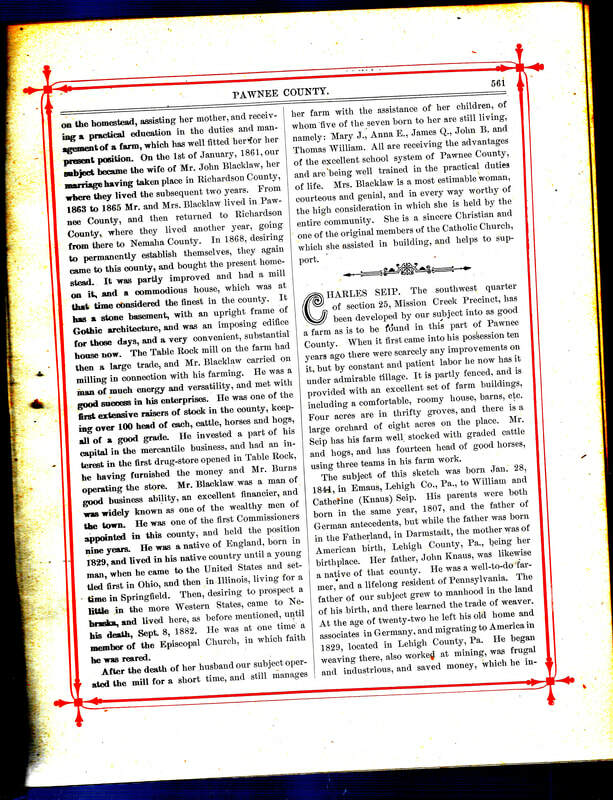 Margaret Blacklaw is mentioned in the Portraits and Biographical Album of Johnson and Pawnee Counties, Nebraska by Chapman Brothers. The Table Rock Historical Society has a couple of copies of that most excellent book. What ever happened to her? We don't know. Only the stones of her husband and daughter are in the Table Rock Cemetery. 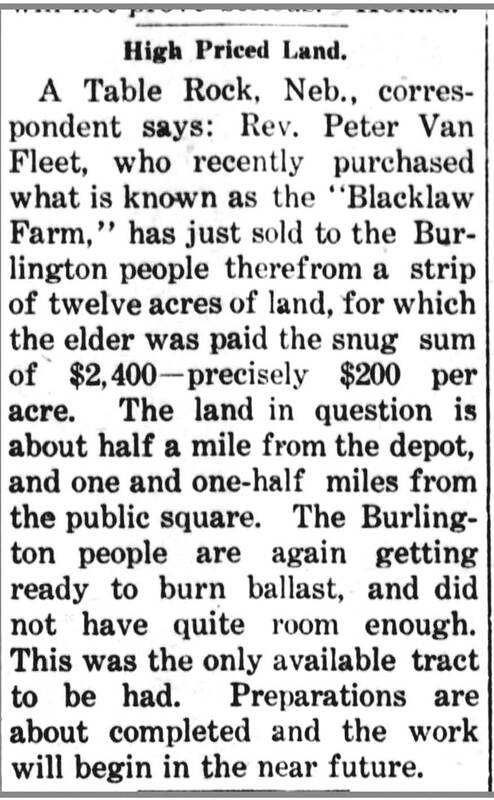 The farm was sold to Peter Van Fleet, an interesting character in Table Rock's history, and, still called the Blacklaw farm, he sold it to the railroad in 1907 for use in burning ballast. 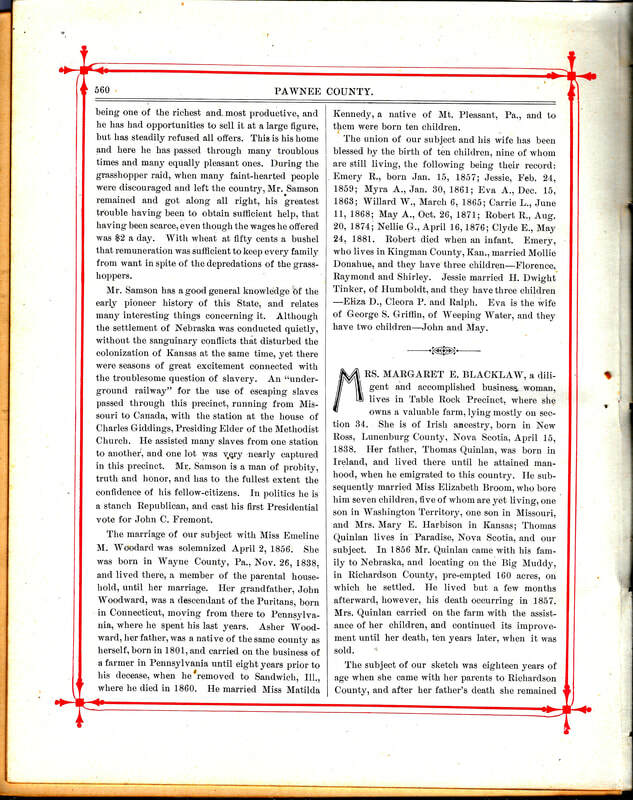 Since Margaret did not die until 1924, she may have sold the farm to move away.